When I first got into travel blogging, the way to make money was by selling links and having 40-50 niche websites with Google adwords ads. Press trips didn’t exist for bloggers and getting paid for our work was tough. There was no such thing as an instagrammer or ‘influencer.’ Ads didn’t pay much, and the idea of getting paid to travel was laughable to most of the industry. Thankfully it is much easier to monetize these days. It’s also a more competitive market. There are ways to jump ahead, though. I discuss them in this post if you want to step back, take a read, and come back to see this follow up. My biggest source of income during the first couple years of my blog was freelance writing roles. At first they won’t pay all that well but you’ll be establishing yourself and in time you can charge more commensurate with your experience (and influence). At first I was getting $50-$75 per article, which was enough to keep me going in cheap countries, and eventually I was able to charge more. It helps a lot when a publication can see that you have some reach yourself to help share the article and get more views, and the more that you grow the easier it will be to get opportunities that pay better. Working for a more established blogger will help you understand how to become more effective with your own blog. These jobs mostly come from in-person networking. At first, I think it’s great to attend industry events like Travel Massive, and even TBEX, if for no other reason than to network with other bloggers, to market your VA services, and to become aware of opportunities. It’s never too early to start with affiliate marketing. The reason why I suggest getting into this early is because the pages that you put on your blog earlier will have more time to be indexed by Google. This is a long game, and you may not see the results from the fruits of your labor for a year or two, but this can become incredibly worthwhile. For example, I wrote about what to pack for Southeast Asia four months into my blogging career and now it’s one of my most successful affiliate pages. It took a bit of time but it paid off. This is always true for me. I never really know how a post I write will do until much later, so I just keep trying! Whichever hotel booking and clothing sites you regularly use. Whichever travel insurance you use. The key is to only promote products that you truly love and use yourself. To successfully market products to your audience, their trust always has to come first. Check out this post for info on how to write a good affiliate post. Ad revenue is based on traffic so in the beginning, there’s not much point. However this will eventually be worthwhile and it’s something I really wish I had done about a year sooner! At first it was hard to see my site with ads on it. I was so used to it looking the way it had for years, ad-free. However I believe that most readers don’t mind them (I haven’t had any complaints) and that your loyal fans will be happy to see you making money. I personally use Mediavine. Photography is a big part of travel blogging. I spent quite a while learning my way around the camera and practicing with editing. These days, photography is a huge priority when I travel. Having a visually appealing website is important, and since Instagram is such a huge marketing tool, it’s a great way to get paid work. Most of my paid work actually comes to me through my Instagram! Plenty of bloggers make videos here and there but I don’t see much crossover between blogs and YouTube. People seem to be very dedicated to one or the other but not both. If you make great videos and are consistent, building up an audience on YouTube and putting ads on them is a great way to develop an income stream. This is also a long-game approach, like most of what I suggest on here, but if you build up a strong and consistent audience then you’ll have yet another passive income stream. For more on how to get started on the right foot, check out my review of the YouTube course that I used. Eventually, when you have built up your audience and social media channels, you may have paid opportunities come your way. It might include product partnerships (like mine with ZAGG) or destinations (like mine with Kyrgyzstan), wherein you agree to a certain amount of deliverables in exchange for an all expenses paid trip and some cash. This sounds like the dream, and it is, but it only makes sense if the destination and the campaign really make sense with your brand, and if you are capable of delivering everything that you promise. I rarely pitch, and I never really did. These opportunities tend to come directly to me. Once you get to a certain level, you’ll have more opportunities coming to you than you can accept, and if you have to be out cold pitching, it’s probably not quite time to be seeking these types of opportunities yet. Work on building your audience, building historical data to prove that you are worth spending money on, and putting out amazing content, and the work will follow, trust me! My buddy holding one of the books I wrote in Indonesia (while I took a swim). The most successful entrepreneurs in this industry have their own products for sale. It could be a course, a book or several, tours, or a whole host of other options. The more creative you can get the better! It’s important to have a minimum viable audience before jumping in and creating a product, because otherwise there is the danger that you will spend all this time on product creation and not have any buyers. Your time is better spent building up an audience first, and marketing products to them later. Besides, without really being an authority on any particular subject, which requires time and establishing yourself, it’s kind of hard to sell products anyway! There are not many travel bloggers who have a podcast, but this is another great way to make money and contribute something meaningful that is not already incredibly saturated. I believe this is actually a huge opportunity and if you can come up with something of quality that has not already been thought of, you can strike while the iron is hot. While I haven’t reviewed it, I fully trust Pat Flynn and would take his course on podcasting if I were to start one myself. Public speaking is a great way to make money while also spreading awareness and establishing yourself as an authority. Like the previous few suggestions, this is something that will make sense to pursue after you have established yourself. This is something I have not done a lot of, although I would love to get into it more. It’s a great way to add credibility to your brand. Those are the best ways that I’m aware of to make cash from a travel blog. None of what I listed will get you rich quickly, but it is sustainable, based on providing something to people that is honest and of real value, and can help you build a lasting business that survives the test of time. Most of all, innovate. Stay on top of the curve, keep working hard, and come up with new and exciting ideas. Put your energy into the things that you can do better than anyone else, and the money will follow. Thanks for the encouraging words and advice. I have just started myself and find information like this invaluable! Great blog btw. This is a good honest insight Kristin. I’m about to hit my 2 year anniversary and I’m still trying to build my audience. It is still a long way short of where I’d like it to be. It is also too small to see any benefits yet from affiliate links. At times it is disheartening to see “new kids” on the block become so quick at obtaining a sizeable audience when you know you put in just as many hours as they do. You’ve just got to pick yourself up in those dark moments and keep pushing on. There’s so much that goes into it that I couldn’t even cover in a 5-part series. As you know, it’s all about finding what works for you but yes, I have those dark moments too. I am sure we all do regardless of industry. This series has been a great read Kristin, and answered a lot of questions!! Thanks for putting it together so thoughtfully! Thank you so much for this series. I’ve been blogging for about eight months and still learning, trying to find my voice. This will definitely help my journey. I love the advice about focusing on the travel at the beginning. My blog is only a few months old and although I want to grow my blog, I really don’t want it to take away from my experiences overall. I’ve seen a lot of bloggers advise to post up to 3 or 4 times a week from the beginning. While I understand why that would be beneficial, if I was posting that often I know the quality of my writing and trip would suffer. I’ve really enjoyed this series. Thank you! I posted 2-3 times per week in the beginning but have since had to go down to more like 1 due to other obligations. The quality is what matters most so focus on that and on living! This is arguably the most common question asked in the travel blogging community: how can I make some money from this? It’s certainly not easy, and I’d advise anyone getting into blogging that they shouldn’t do it for the money – because you might not get any for a long, long time. For me, though, travel blogging has been great for my career as a journalist – because I now know how to write for SEO and know the ins and outs of social media. As a result, I can now command more of a salary than I would be able to if I hadn’t taken up blogging. My point exactly. You won’t make tons from your blog, most likely, but it can open a lot of doors. Definitely. It’s about the content at the beginning and end of the day. I think true love for the subject matter shines through and it’s the only thing that will really keep you going. I’m a huge fan of your blog! I’m in the planning stages of starting my own travel blog. Do you use mailchimp or aweber, or which do you recommend? Thanks! I use mailchimp. No experience with anything else. I’ve just finished ready all 5 posts and found them really helpful! Especially when you have given links in the first few posts. I’m so happy to hear that you found out about my blog from a friend. Personal recommendations are awesome! Glad you have found the posts helpful and happy blogging and travels. I have just started my own travel blog and right it is growing but slowly, I am trying to make only quality content but it can be hard for someone like me who is a crappy writer. I don’t expect to make any money at all until after maybe one year or more but I hope one day that I can travel the world living on the money I make from my blog. Thanks for all the posts with great advice. I think the most important thing is not to focus on making money, but to improve your writing at this point. If you really believe you’re a crappy writer, why should others read it and why would it generate money? I’d suggest taking a writing course, reading more, really honing your skills or maybe focusing on something else, like photography, if that’s more your thing. That can be the fun part. I think originality is best! I had a sort of idea but unless people know their ancient Greek stories, they wouldn’t get what it means! I just re-read this post for probably the hundredth time and something leaped out at me that I hadn’t really noticed before – specifically the advice from your friend Will. It just occurred to me that worry more about the blog and not really getting into my travels has been exactly what I’ve been doing for the last few weeks. And I now realize that it’s why I’ve had this feeling that something isn’t quite right, that I haven’t really done anything etc. So thanks for yet another bit of inspiration and guidance. You are definitely my travel muse :). It’s so hard to balance work and play, especially with bad wifi connections, so much stimulation away from the computer, and so on. I’m glad that I got two years of almost exclusive travel and not too much work, but find it hard now to buckle down when there are adventures to be had. Thank you for this guide and the many useful tips and links. My website is still under construction so I have no real content.. yet. My thinking in the very early stages was just to keep a travel diary for myself, friends and family but, I really want to become nomadic/location independent. I am currently working my 9-5 (ugh), as much overtime as I can physically handle and in what little time I have left, I am researching everything from travel gear to social media marketing and lots in between. My head is swimming but I am learning So much each day. I realise I might be taking on a lot but my flight to Bangkok departs in six weeks!!! Thanks again. I really enjoy your writing style and this guide is a gentler introduction to some of the really heavy reading (in the aforementioned reading list) that seemed so daunting at first glance. Sorry this is quite long..
Hey Stuart, so glad that you find this helpful and an easy introduction. I’ve considered publishing my entire business plan as a free ebook (since I write down all of my inspiration and the steps I’ve taken – what has worked and what hasn’t – along the way). Perhaps that’s something I’ll do in 2016 or 17, for those who want some heavier reading 😉 Best of luck and would love to see your site when it’s live! Yes, I’m also just chucking away at it. Trying to get good content out there. It seems to take forever. How long, in general, would you say it takes to grow a good audience (all else being good)? 3 years or so? Is there a point where you just get some momentum and it’s not moving at the pace of molasses? Now making money through traveling become so much easier than before. people can easily do vlogging with a camera and post it on youtube and this way they can earn huge money. I agree with you that ”the few travel bloggers who make a solid living off of their blogs have been at it for years.” I have always been facing problems with How to make money and was trying to hire someone to help me. Thank you for sharing your experience with us. It will help for new bloggers. Thanks for these tips, they are invaluable. I have a quick question. I don’t plan on starting a blog now, but have been encouraged to start one, but maybe after retirement one day. This isn’t about making money per se, but blogging in general. How do you put yourself out there but at the same time maintain some level of privacy and safety? I often worry myself when interacting with others on-line (both ways, giving too much info on my end or asking too much info). Thanks for your advice or if you have a link to where I can get more info on this, let me know. Maybe I can use this info in the future. Any blog I have in mind if I ever went that way would take any proceeds from it and give to some charity. Hard to say, I guess it just comes down to personal preference. I just do what I find comfortable! I first came across you because you were one of the few people I could find who had also been to the blue lava in java. We loved it there, killed my camera like, but got a few good shots before it died. Nice and Informative. WOW, I like the photographs. Thanks for sharing. I considered affiliate marketing for my travel blog, but someone told me that it might be too early as I have just started out. However you say that it’s never too early for affiliate marketing, who should I believe? It would be interesting to see how or if this content has changed now in 2019 with the over-saturation of travel blogs, companies cracking down on “influencers” staying at their accommodations for free, and other changes in both the industry and its interaction with social media. 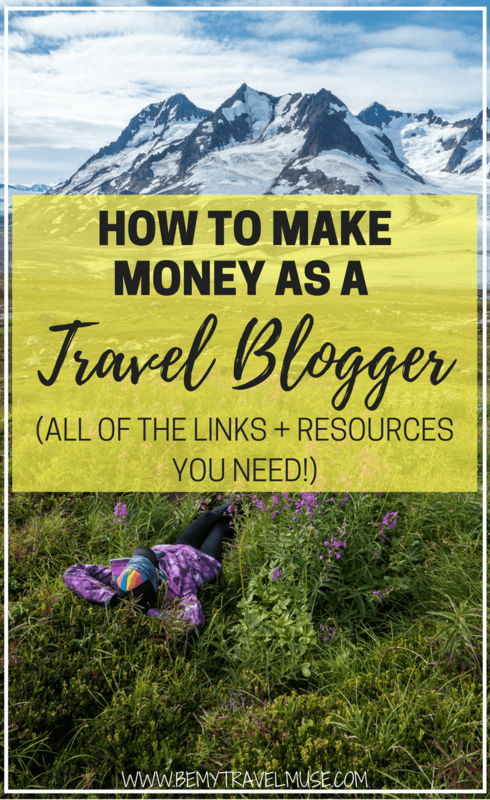 Great post about making money through travel blogging. The point you make about earning huge amount of money through travel blogging resonates well, because it details that bloggers can earn profit in their travels through advertisement, photography, content writing, and even public speaking.